January 28th is Salt Awareness Day < or SAD for short. It is organised by a group called Consensus Action on Salt and Health (CASH) whose Chairman is the ubiquitous Graham MacGregor, Professor of Cardiovascular Medicine at St George's Hospital in London. But rather than being an opportunity to increase appreciation of this fundamental, life-preserving ingredient in our diet, SAD 2004 promises to be a very joyless occasion. At last year’s event Prof. MacGregor announced to the guests assembled in a tent on the terrace of the Houses of Parliament that half of them would suffer from either a heart attack or stroke if nothing was done to reduce the amount of salt in foods. Cashing in on the act (no pun intended) were a number of commercial organisations, including Marks and Spencer and Klinge Chemicals who manufacture Lo Salt, a reduced sodium version of the real stuff. The annual event finished with what was described as a ‘fantastic’ low salt tea that included mini quiches, no-salt crisps and vegetable chips and carrot cake. These people clearly know how to have fun. This year the professor is leading with an equally alarmist claim that 35,000 people will die this year because they eat too much salt < something that many scientists dismiss as purely speculative. Last year he was reported as claiming that the figure was 50,000. It is certainly true that people suffering from hypertension (high blood pressure) are correctly advised to reduce the amount of salt they consume. But for the rest of us our levels of salt intake have only a tiny impact on our blood pressure < so small that in most cases it has no clinical significance whatsoever. Being needlessly encouraged to worry about having a heart attack might well be a greater threat. So why is the population as a whole being coerced into seeing salt as a major threat to longevity when only those with high blood pressure need to be concerned? The answer, it seems, is a matter of expediency rather than science. Many people with hypertension, it is claimed, do not realise that they have high blood pressure. This is not too surprising since health agencies keep moving the goal posts. A previously ‘normal’ blood pressure of 120/80 mm Hg was recently redefined as ‘pre-hypertension’ < a new 'disease' which requires a drastic revision of lifestyle to overcome (see Under pressure). In a sensible world one might imagine that the introduction of regular checks for raised blood pressure would be the way forward < identify those at risk and advise on salt intake accordingly. This, however, might cost a bit of money. The health of the nation is one thing < fiscal prudence is another. So, a 'one size fits all' approach that means we must all reduce salt intake to a level safe even for hypertensives and put up with tasteless egg mayo sandwiches from M&S is portrayed as a rational, precautionary alternative. The result of this now familiar strategy, of course, is that we all have yet one more thing to worry about when we sit down to eat, as if food was not already scary enough. And it detracts even further from our ability to see food as something that we should actually enjoy < as something that tastes good, rather than something simply to be endured as a result of ever-changing health dogmas. I doubt whether any of my Italian friends will be at the SAD 2004 event < especially not my good friend Giovanni. He grew up in Tuscany where salt is a fundamental part of culinary tradition, represented most notably in prosciutto Toscano < a particularly salty, dry-cured ham that was once essential to the survival of contadine families. The extra salting meant that the meat would rarely spoil, unlike the more refined versions of Parma and San Daniele. In contrast to the ham, however, Tuscan bread has little or no salt in it, but uses far more yeast than other breads. On its own it is pretty hard and unpalatable stuff. But when combined with thin slivers of the local prosciutto and a dish of freshly pressed olive oil, a natural balance is achieved to provide the perfect start to a meal. This natural regulation of food ingredients comes not from research by men in white coats or the policy statements of government agencies but through a proper appreciation of taste, nurtured by centuries-old traditions that have upheld the joys of eating. These are traditions that we are in danger of losing altogether < the celebration of taste being abandoned in the pursuit of an illusory sense of health correctness. Giovanni still makes his own prosciutto in the cellar of his house in Oxford < and it is quite delicious. It is a lengthy process in which a whole leg of pork is encased in dry salt for 15 to 20 days depending on its weight, washed in red wine vinegar, coated in black pepper and then hung in a cool airy place for at least a year to develop its unique character. Not everyone has a cellar or such ambitious culinary inclinations. But everyone can make bacon. So, by way of SIRC's contribution to Salt Awareness, perhaps a more appropriate one than that on January 28th , here is a simple recipe for dry-cured streaky bacon < similar to what what the Tuscans would call pancetta. You will need a fair sized slab of belly pork, the thickest you can obtain, with the bones removed. The better the quality of pork, the better will be the taste of the bacon. You will also need a bag of salt. You can use expensive sea salt or Maldon salt if you wish, but the cheap cooking salt found tucked away on the bottom shelf in supermarkets works just fine. To the salt you could add a little soft brown sugar and some black pepper. Find a dish or plastic box large enough to hold the pork and place a layer of salt about half an inch deep in the bottom. Put the pork flesh side down on the salt and heap more salt over the top. Rub into the skin well and leave for a couple of hours in a cool place. After this time the salt will have drawn out a considerable amount of liquid from the meat. Pour this away and add more fresh salt. Cover the dish with cling film or plastic lid. Put in the fridge for three days < or up to five days if you have a particularly thick piece of meat. Turn the meat over each day and replenish the salt to ensure that it is liberally covered. After the salting period, wash the meat under a running tap and hang up to dry for two or three hours. Then wrap loosely in greaseproof paper < not cling film or a polythene bag < and place the parcel on a large plate. Leave for a day or so in the fridge, changing the paper as it becomes damp. You now have bacon. Slice as thinly as you can with a very sharp knife, fry to your preferred crispiness, and enjoy! 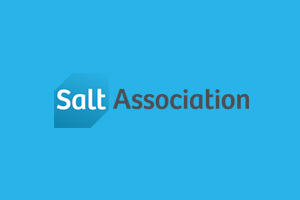 The Salt Association is the trade association representing UK manufacturers of salt for domestic, catering, water-softening, industrial and de-icing uses.